This morning, I got a frustrated e-mail from a client that presents a common conundrum: Why do we sometimes gain weight after a “good” week? Up a pound and super frustrated. I may not have had a perfect week, but it was better than what would have been typical for me. And yet, a pound gain. I worked out almost every day, ate better than my “normal”, but here we are… Where is my motivation to eat any better if I gain a pound? Oh and the “muscle weighs more than fat” excuse doesn’t cut it for me. The request “muscle weighs more than fat doesn’t cut it” makes me realize how often people’s genuine frustrations are over-simplified and poo-pooed by well-meaning professionals. She’s right – in the span of a few weeks, significant muscle hasn’t been gained. It’s just too fast. So why the fluctuation? And what do we do when this happens? 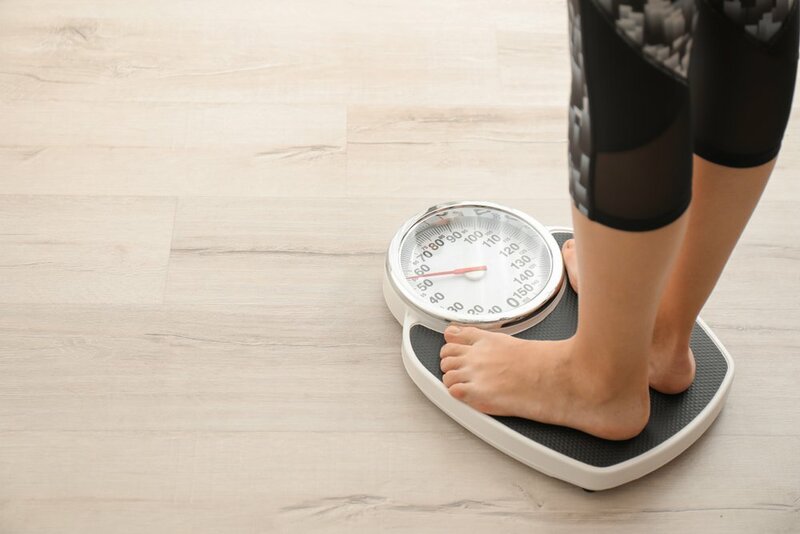 Without getting too obtuse, the simplest way to explain fluctuation during weight loss is to point out that the scale measures more than just fat gain and loss. 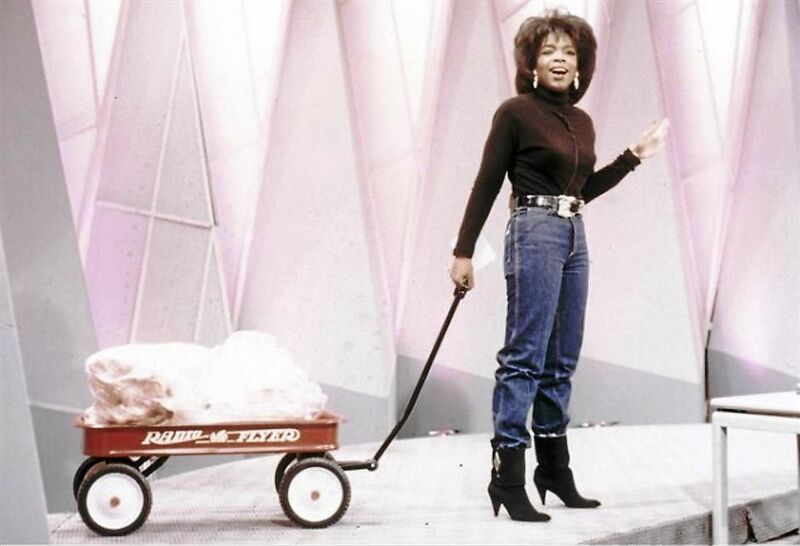 When Oprah wheeled out a 67-pound wagon of fat onto her stage, it permanently cemented in many people’s minds that when you lose or gain weight, it’s fat. But fat is, very honestly, only one part of a very complex picture. The first thing to remember is that your body is complicated. 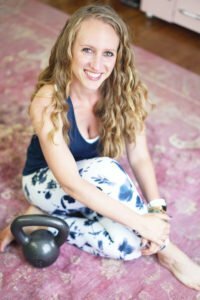 There are lots of things going on in your body at the same time – while you’re consciously focusing on losing weight from stored fat through exercising more and eating better/less, your body is also busy attending to things outside of your conscious control, like fighting infection and disease, healing muscles, digesting food, shuttling hydration throughout your systems, and more. But when you weigh yourself, the scale captures all of this, in one broad stroke. In other words, weight isn’t a bad tool of assessment, especially over time, but it’s blunt. Think of it this way: it’s like looking at your shadow to capture your appearance and size. An actual photograph would distinguish that some of your shape is clothing, but a silhouette would make you seem misshapen and distorted, without taking the clothing into account. You’d get the general idea, but you’d only be seeing a shadow of what you really look like. Similarly, weight is a good general picture, but within a few pounds, is really just a rolling average. Hydration – even though increased hydration tends to lead to weight loss in the big picture over time (because of the effect that it has on appetite, health, and behavior), it can cause the scale to fluctuate confusingly from day to day. Digestion – undigested (or partially digested) food moving more slowly than usual through the digestive tract can cause the scale to fluctuate from day to day. Glycogen – the level of energy storage that we shore up in our muscles to prepare for exercise and activity can be lower one day and higher the next, resulting in an increase in scale weight. In fact, the more we exercise, the more our bodies make an effort to build up glycogen storage. Sodium – even a slight change in sodium intake can cause the scale to move up or down, because of the change in water retention in our bodies. This is most likely to happen from restaurant or packaged foods, and – as long as your overall sodium intake is in check – is nothing to be concerned about. Change in menstrual cycle phase – weight set points can fluctuate from week to week for women as the body changes gears, which affects levels of water retention, depending on whether eggs are being matured, released, or shed. Again, this is something completely outside of your direct control, and nothing concerning. Muscle inflammation – when you exercise and put stress on your muscles, your body activates a healing response that involves sending water to the affected area. If you’ve been exercising more than usual, you may find that you put on a pound or two, and – assuming you’re not over-eating, it’s probably just water and the downward trend will resume. Again, this is not concerning. You can take heart that, if you’re checking all of your weekly habit boxes of exercise and nutrition (and there’s not a glaring area of either denial or avoidance), that it’s probably not fat that’s causing the uptick in weight. It’s probably one of the above factors that I described. By the way, the weirdest and most logic-defying one is perhaps the healing of the muscular inflammation that causes water retention. I think this is what is most disappointing when someone feels like they’ve had a “great week,” but end up gaining weight. Exercise is a good stressor, but it’s still a stressor, which means that your body has to provide a healing response to address the micro-damage done to the muscle. The water retention associated with this can be absolutely puzzling (and infuriating) for someone who has faithfully exercised daily and expects (reasonably) for the scale to have scooted down a bit more. The important thing to keep in focus is that – if you feel reasonably confident that you’re doing your best to modify your eating and exercise more – you’re probably making progress, regardless of what the scale says on that particular day. I have seen clients lose three pounds, gain two pounds, lose four pounds, and follow a zig-zag trajectory. Then there’s the clients who do “everything right” and stay stuck at one weight for weeks, and then start dropping again out of nowhere, despite changing seemingly nothing about their behavior. Again, there are millions of processes going on behind the scenes that also affect weight, but you can feel comfortable that your eating and exercise habits are certainly improving your health, your body composition, and your experience of life… but they’re happening in concert with a million other tiny processes that distort what you’re seeing on the scale, just like clothing distorts the shape of your shadow. How we feel about our weight often has more to do with our expectations than with what the scale is actually showing. When you have this experience, take a second to try to understand why you’re not able to shrug off what you’re seeing. High expectations for a certain weekly amount of weight lost? A specific ideal of what is your “goal weight,” which you hope to achieve within a certain time frame? Again, we have to remind ourselves: weight is capricious. Having high expectations of the scale itself only leads to disappointment. Most fitness marketing makes it easy to have these high expectations, though. We are often promised quick results, and a sense of quid pro quo for our efforts – if we work really, really hard, we’re going to get really, really good results. While I don’t discourage hard work, I do discourage looking at weight as something that we can directly control…. because we definitely cannot control it. In my experience with clients, a reasonable expectation for weight loss, especially if you have tried to lose weight (or have lost weight) before, is about one pound per week until you reach a good resting point. And that includes the zig-zagging – three pounds down, two pounds up, and so on. So even if you’re truly, genuinely making progress, you may be disappointed every few weeks by an unexpected fluctuation. I have seen people work intensely hard for this one pound average, and other people put in a moderate amount of effort for this one pound – but it still seems to be the average, regardless of how hard people are restricting food, hitting the gym, and focusing on weight loss. This is partly because of normal fluctuation, and partly because the body will mobilize self-protective measures to prevent too-fast weight loss (more on this in a moment). Keeping this in mind, I advise clients to “smooth out” their sense of progress by zooming out and looking at the big picture and the “net” numbers. This is mostly a game of enjoying your “results” more by adjusting your expectations. Instead of hoping to lose a set number of weight per week, try looking for a general range per month. For example, instead of aiming for one pound per week, aim for 3-5 per month, with weekly weight only providing an adjacent view into the results of your efforts. This way, if you have been working on your lifestyle changes for a month and you “gain three pounds” this week, you may see that you really lost three pounds for the entire month (because last week you were six down), which is a magnificent step forward. But there’s really a bigger issue here. Where is my motivation to eat any better if I gain a pound? Why would we focus on weight loss, if weight loss is so difficult and capricious? It’s a legitimate question. Why would we invest so much time, energy, and effort – and sometimes even genuine sacrifice – into something that seems to consistently disappoint? The best way to understand and interpret the scale is to use it like a GPS or map. When you are using a map to drive, you must keep your eyes on the road while letting the map give you clues on how to respond to your environment. You occasionally glance at it, while paying attention to the road and the reality that’s happening around you. A map doesn’t help you if a deer runs into the road, or if the interpretation of a bend in the road could be ambiguous (like if it tells you to drive into a lake, for example). The map is neither directly driving the car, nor is the map the road itself. The map just gives some direction. Similarly, when we use the scale as part of our method of self-assessment, we have to remember that it’s just giving us little clues. We have to keep our eyes on the road – our life that’s happening around us. Our habits. Our daily routines. Our attitudes. Our vices. Our efforts. The problem is that this often is not the way we use the scale. Instead, it can become the all-defining metric of progress – the signal that we’re doing things right, or that we’re making the progress that we want. We become glued to it – which means that we start missing out on things that are going right. These responses, while they seem opposite, are actually just two versions of taking the scale too seriously. To use the car analogy, “Screw it” throws the GPS out the window and drives around aimlessly, lost, until running out of gas. “Buckle down harder!” drives right into the lake. The scale, just like a map, is just a tool – and it shouldn’t have that kind of power. If you stop reading this blog post right now, I hope you’ll take this with you: it is possible for the scale to be stuck, or even bouncing around, and for you to be making exactly the kind of progress you want to be making. I am so, so glad this client e-mailed it. It’s a frustrating experience, and there’s a difference between managing your feelings and minimizing your feelings. Don’t minimize. You’re working hard, and it’s natural to have high expectations. When you ask this question, you are opening up your eyes and looking directly at the road, instead of getting too distracted by the map. Use what you learn to make small edits to your approach. Finally, remember that weighing is not a requirement. There are a dozen ways to assess your progress, and weighing is only one of them. If you find yourself feeling stressed about your weight loss trajectory, you can always put the scale away and just focus on your healthy habits without the context of weight. But most of all, don’t give up on yourself. The scale doesn’t know whether you had an excellent week or a disappointing one, but you give it the power to discourage you. You can take the power back in many ways, and live the healthy lifestyle that really fits you, and gives you what you want from it. I hope Michael Scott reminds you: focus less on the map, and more on the road in front of you.